Comics have come a long way from punching baddies and promoting war bonds, but some things never change. Popular comic genres will always have a place among readers, including superhero, action, crime, funny animal, mystery, horror, the now-gone western genre, and of course, romance. Though most romance comics haven’t seen the light of day since Archie got married, it’s still a popular genre in Japan and teen-oriented works, which perhaps is why Weird Love is finally getting the re-print it deserves (well that and the recent nostalgia horror revival). 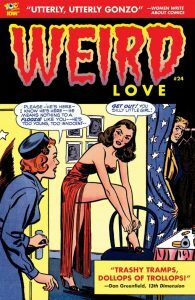 Weird Love features a collection of assorted romance comics with an ironic or horror twist from various publications of the 50’s and 60’s while promising to leave you with your jaw dropped. Unfortunately, it seems that by issue #24, any bizarre work has long been published in previous issues, leaving you with just a mild-case of slack-jaw and a confusing misunderstanding of how love works. That being said, it’s still pretty enjoyable and if taken with a grain of salt, is a surprisingly fun and silly read that explores the in-and-outs of romance stories in the early days of comic popularity. Issue 24 follows the same layout formula as previous, single-issue, horror republications: a quick introduction by Craig Yoe, Image Comics collaborator and founder of Yoe Comics, followed by six comics pulled from various romance publications. The stories range from slightly strange such as the woman who falls in love with a ghost (or so she thinks) and the dog that helps his owner find love, to morality tales that include the girl who falls for the high school gangster or the glitz-queen who quickly learns the vileness of success. The comic even reprints an old advice comic on different way to be courageous in a relationship! Perhaps the only authenticity complaint is the lack of old advertisements, but it can be forgiven for the utter ridiculousness that these comics already are. Weird Love is definitely one of those comics that has dated itself right out of relevance to the point where you find yourself asking: did anybody really take this stuff seriously? The stories are so ludicrously over-the-top and dramatic, it’s like reading romance urban legends. There are very clear moral tales ham-fisted into the stories, especially with the women who sacrificed love for fortune, and each one learned that it was better to stick to marriage and motherhood than chase the dragon of personal success. These works did not hold their readers to high standards, that’s for sure. Also, as stated, there was just not enough Weird in it. There was a smidge of crime and horror, but most of the stories were straight romance ending with marriage. Granted, there’s nothing wrong with romance and marriage, but throw in some more werewolves or something! Spice it up! Of course, for any fan of old comics, there is a redeemable value to the work. Despite its flaws, it’s actually kind of fun and a great archive of comics long gone. 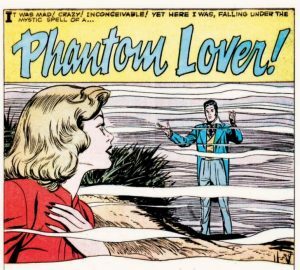 Weird Love is a wonderful example of what was big in the Golden Age of Comics and allows readers to check out comics that they never would have had access to outside of being a serious collector. It’s also one of those works that you just can’t help but enjoy BECAUSE of its outdated ideals. It’s funny in an ironic, campy way, like Plan Nine from Outer Space or bolo ties. Perhaps the real weird in Weird Romance is that anyone thought that this is how human interactions work. Take it or leave it, Weird Romance is weird on many levels, even if it’s not as scary as the horror genre that it’s tagged under. Just don’t take any advice from it.